Tom Thomson was one of Canada's most famous artists. 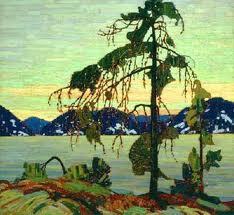 Associated with the Group of Seven, he actually died before the group was formed. Nevertheless he, and his work, significantly affected art in this country. One of his most famous paintings was The Jack Pine, found at the top of this post. Well not literally. It was actually found near Grand Lake in Algonquin Park, Ontario. Thomson died in 1917 at the age of 39, drowning in Canoe Lake in his beloved Algonquin Park. The park served as an inspiration for many of his works. Now, I hear you asking, "What in heaven's name could Dufus possibly have in common with Tom Thomson?" After all, I'm not particularly artistic. Sure I enjoy art and music but from a distance...on the receiving end, as it were. And I've survived well past 39. So far so good. And, while I could never participate in a 200m butterfly, I like to think my attempts at the dog-paddle would help keep my head above water if I fell out of a canoe. But then what the hell would I be doing in a canoe in Algonquin Park in the first place? What do we have in common? Well now it can be told. The inspiration for The Jack Pine wasn't found in Algonquin Park. No. It was found in my side yard. It's true! See for yourself. C'mon. Use your imagination. I can see it if I squint a little. Thomson's work has often been referred to as post-impressionism. I don't know about you but I'm pretty impressed! I think you should charge admission to see your Tom Thomson tree. Hey, that's a great idea! And I'd better hurry 'cause we're having it cut down soon. i'm sending this to Ripley's! Hey great! We can title the entry Believe It Or Knot. Wow, I'm stumped. The likeness is uncanny!